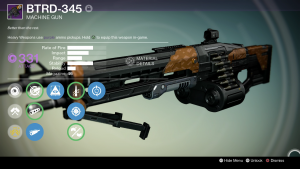 The BTRD-345 is a Heavy Machine Gun in the House of Wolves DLC. It falls in the High Impact, Slow Reloading group of heavy machine guns… much like the Jolder’s Hammer, Against All Odds, and Thunderlord. It comes stock with one of the largest magazines available out of all its similar heavy machine guns. You can only Get it as a drop from playing in the Crucible. Because it comes stock with very high impact, fire rate, range, stability and magazine size there really is only one factor we need to compensate for. The reload speed. All the other perks we can get for it will just accentuate its strengths. Here is the break down of my Perk choices. Barrell – Agressive Ballistics or Field Choke. They both increase Impact… I actually prefer Field choke over AB, but both are good. Hidden Hand – Again, it’s one of my favorite perks… another good choice is Counter Balance or Surplus. Small Bore – Increases range and stability, slower reload and smaller magazine size (42 instead of 46). 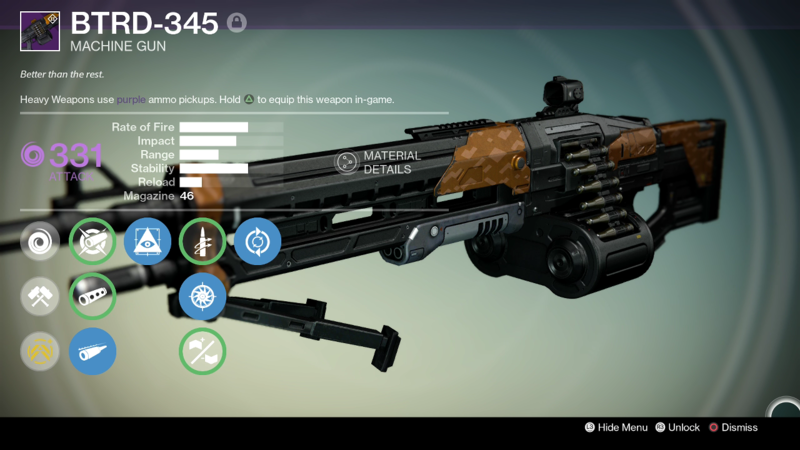 In my opinion this is one of the best heavy machine guns you can bring with you into the crucible. It has almost the highest numbers available in terms of rate of fire, impact, range, stability… and an extremely large stock magazine. It suffers in the reload speed department but we can fix that with the Feeding Frenzy perk. Making it just a absolute beast in pvp.